Orthez is a municipality in the Pyrénées-Atlantiques department, in the South-West of France. It is ideally located at the edge of the Pyrénées assembly line and not far from the Atlantic Ocean. Orthez has different districts: Départ (South), Castétarbe (West), the Soarns (East) and the city centre (North). Orthez has a historical importance as a pilgrimage town. Indeed, the town is on the pilgrim route that leads to Santiago de Compostela in Spain. 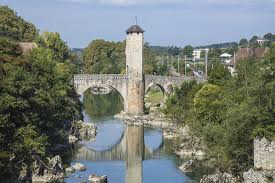 The most impressive sight in the town is without doubt is the 13th-14th century stone bridge the river Gave de Pau. Halfway across the arched-bridge, it has an unusual gateway-tower. Originally, the bridge had two of these defensive towers and the central part of the bridge was connected to the river banks by wooden platforms which could easily be removed if the town was attacked. On two occasions, the bridge successfully protected the town, the first in 1569 during the War of Religion and in 1814 when it resisted the troops of Wellington. Then you can pay a visit to the 12th century Church of Saint-Pierre, which contains some sculptures worthy of attention. There is also the pentagonal tower, called the Tour Moncade, which is all that remains of the castle that once stood there. Finally, be sure to visit the Tourist Office to admire the 16th century stone town house, called the Maison Jeanne d'Albret. This is where the mother of Henry IV lived. In Orthez, there are different kinds of restaurants and bars, and you can also go to the cinema. In Orthez, there are two markets. The biggest one is on Tuesday, you can find food and clothes. The second one is on Saturday, but offers only food. You can also find different shops in the centre. Standard time zone: UTC/GMT + 1 hour. The climate in Orthez is warm and temperate. The average annual temperature is 13 degrees Celsius and the average rainfall is 1,039 mm. In Orthez, there is a railway station so you can travel by train, but you can also travel by bus.